Did you even know you could make a yeasted dough in a Vitamix? I for one had never had the opportunity to test out this method; So when Vitamix & feedfeed reached out about collaborating on a recipe to showcase their new Ascent Series blenders, I could not have been more excited to give it a try! Vitamix was kind enough to send me a new A2500 blender, and needless to say I wasted no time taking it for a spin, to make a sweet roll dough. In a bowl, add the yeast and a couple tsp of the sugar. Pour the warmed milk over the yeast and sugar and let stand for 5-10 minutes to proof. When you come back to your yeast after 5-10 minutes it should be frothy – this indicates that your yeast is active and good to go. If you come back and your yeast hasn’t gotten frothy or foamed up, discard the contents in your bowl and start over with new fresh packages of yeast and proof again using the same technique. Once you have proofed your yeast, add the remaining sugar to the mixture as well as the softened butter. Whisk to combine until the butter is broken up into chunks. Add your eggs and whisk to combine. To your vitamix container, add your flour, salt & cinnamon. Turn the blender on to level 1 and slowly increase speed to Variable 6 until a hole forms in the centre of the mixture. Select Variable 3. Turn machine on and remove the lid plug. Pour wet ingredients through the lid hole. Once you have poured it all in, replace the plug. Select High speed and pulse the machine 8-10 times until a large dough ball forms. The dough should be soft and a bit sticky. Lightly flour a work surface with the remaining ¼ cup of flour and dump your dough out onto it. Knead your dough by hand for about 5 minutes or until it is smooth and elastic. Next, place your dough into a large butter greased bowl & lightly grease the top of your dough. Cover the bowl with plastic wrap or a dry tea towel. & set it aside to rise in a warm place for 1 1/2 – 2 hours or until doubled in size. ** Tip: If your kitchen is a but chilly, simply preheat your oven to about 200 degrees while you are preparing your dough, shut it off and then place the dough in there to rise. There will be enough residual heat in your oven to keep it nice a warm. Take a small plate and set it in your freezer. Meanwhile, in a large saucepan, add chipped rhubarb, strawberries, lemon juice and sugars. Stir with a wooden spoon to coat everything. Bring the mixture to a boil and reduce heat to medium high, and continue to cook the mixture at a rolling boil for 20-30 minutes. Stirring constantly to ensure the bottom doesn’t burn. After about 20-25 minutes remove the plate you had in the freezer and take pour a small tsp of jam onto the plate. Tilt the plate up and allow the jam to slide down the plate. If it jells your jam is ready. If it is still runny, continue to cook for another 5 minutes and then test again. Once your jam is ready, remove it from the heat & stir in finely chopped basil. Pour the jam into a heat proof bowl and place plastic wrap directly on the surface. Set in the refrigerator until your dough is ready. In your vitamix container, add the softened butter, granulated sugar, lemon zest and cinnamon. Set your vitamix set your vitamix to level 2 and allow it to blend until smooth. Add flour and blend again until combined. Set aside until ready to use. Once your dough has risen, punch it down and turn out onto a lightly floured surface. Roll out into a rectangle that is 1/4 inch thick. Spread butter filling out across the dough, leaving a 1 inch border at the top and bottom. Next spread 1 cup of your jam out over the dough, again leaving a border at the top and bottom. 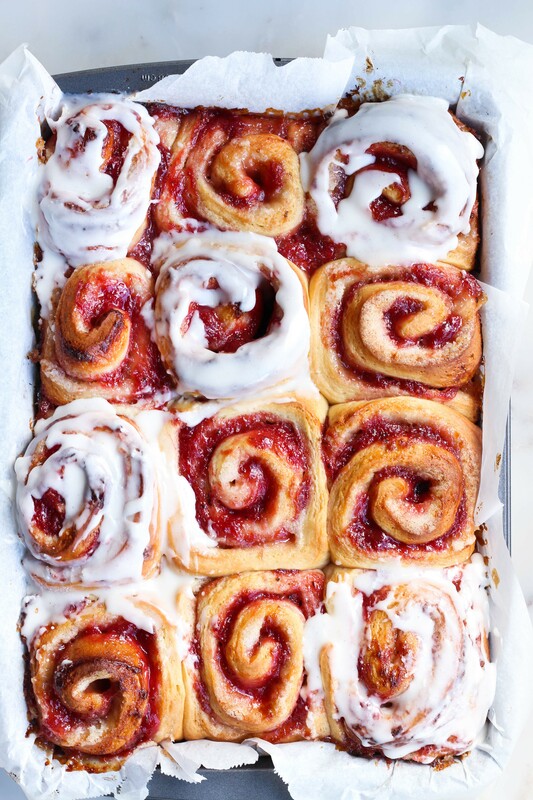 Roll dough up jelly-roll style and pinch the end together to seal. Cut into 12 even 1 inch rolls. Place rolls into a parchment lined 9 x 13 inch baking pan. Set aside to rise again in a warm place for another 30 – 45. While your rolls are rising, preheat your oven to 350 degrees. Sprinkle with granulated sugar and bake for 20-25 minutes or until golden. Remove from oven and allow to cool 5-10 minutes before frosting with vanilla bean glaze. In your vitamix container, add all of the ingredients. 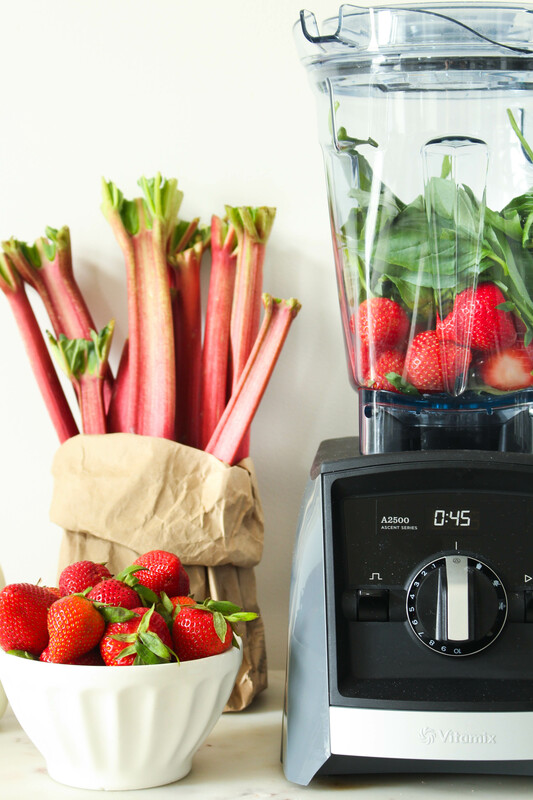 Turn your vitamix to level 2 and blend until smooth and creamy ( about 30 second). Once your rolls have cooled slightly. Pour the glaze over top and allow to set for another 5 minutes. Enjoy!